Edwin Arnaudin: As we exited the Fine Arts Theatre on opening day of Michael Moore's Fahrenheit 11/9, a friendly employee asked us what we thought. While I struggled to organize my reaction, you replied with something along the lines of, “So many movies in one.” Mind expanding that summation? Bruce Steele: Sure. While Moore's Fahrenheit 9/11 seemed like a coherent critique of the Bush family and their dealings — in Moore's slanted, semi-comic style, of course — the new Fahrenheit is actually a series of short documentaries on topics that only tangentially relate to President Donald Trump. Most prominent is his Flint water crisis coverage, a scandal that predates the Trump administration. 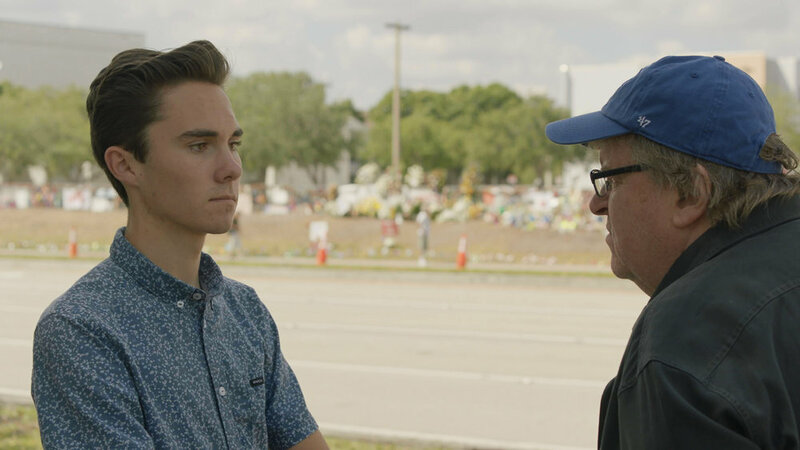 Then he hangs out with the young leaders of the anti-gun campaign inspired by the Parkland, Florida, high school shooting, scenes that also mostly do not address Trump. The third major focus is on first-time candidates for Congress motivated by Trump. Given the prominence of Trump on the movie poster, weren't you surprised by how little sustained attention the current administration gets in the film? Edwin: Well, as someone who tries not to encounter the president in visual form, I think the film offers plenty of Trump video clips. But, yes, Moore’s slightly scattered approach suggests that he’s making up for lost time since his last takedown of the executive branch, though it all ties together well enough. He presents Flint's water problems and Michigan’s general troubles under Gov. Rick Snyder as a stepping stone to Trump’s election and the firearm and congressional storylines are suggested as consequences of the current administration. The multi-pronged attack seems like the right way to go. Were you hoping for a more focused scope? Bruce: There's nothing wrong — in the Michael Moore world view, anyway — with what's there. But since Moore kept warning people before November 2016 that Trump could well win because his message was resonating with people Moore was talking to, I was hoping to Moore would delve into the realm of Trump supporters and mix it up a bit. I wanted him to illuminate the source of his 2016 predictions, not just hang out with people he generally agrees with, which is what I felt he did for most of this movie. Did you learn anything new about Trump supporters from the film? Edwin: Can’t say that I did, though I got a pretty thorough education on the overly-confident liberal mindset going into election night, of which Moore remains critical. His recounts of crossing paths with Trump and his family members — including Jared Kushner, an advocate for Moore’s film Sicko — are amusing and paint a troubling before/after portrait, but it’s all pretty one-sided. I wonder if he had trouble getting people with opposing viewpoints to speak with him on camera or if he even tried. Bruce: That's possible. One-sided is his M.O., of course, and since he's open about his bias, that's fine. I'm sure anyone in authority who feels he's a threat or a kook wouldn't talk to him on camera, but I bet ordinary people of all stripes would. But enough about what I wish was in the movie. As for what's there, it's consistently interesting, occasionally entertaining and, as you point out, occasionally illuminating. But it was more snapshot than gotcha — a series of vignettes from the trenches more than any kind of expose. Why do you think it's not attracting the big audiences of some of his previous films or, for that matter, the Ruth Bader Ginsberg documentary? Edwin: My gut instinct is that provocative people like Moore have a short cinematic shelf life. Bowling for Columbine and Fahrenheit 9/11 hit nerves at the right time, but I can see his schtick wearing thin for all but the converted. Where to Invade Next is one of the most insightful and (surprisingly) balanced documentaries in years, yet hardly anyone saw it. I think a similar fate befell Sacha Baron Cohen's excellent recent Showtime series Who Is America? They had their time in the spotlight but continue to do solid work, largely unseen by the masses. What's your theory? Bruce: I think you're right about Moore seeming a bit "more of the same" even for his admirers, and he does seem to be recycling his bag of tricks. Again, there's interesting, insider material here that's well worth seeing, but he never finds an angle on Trump that's uniquely his. I also think despite Moore's attempt to provide a path to optimism for his side of the political divide, it may be all a bit too defeatist for the casual liberal — in contrast to the Ginsberg documentary, which traces a long history of progressive reform. In short, Moore is no longer the most interesting character on the left, and might be at his best these days in small doses, on TV chat shows. Who did you find the most compelling figures in Fahrenheit 11/9? Edwin: Honestly, a less-than-flattering Barack Obama for his bizarre behavior in Flint. Moore is pretty harsh on him — probably for good reason, even if it hurts — and, for even more well-founded reasons, Hillary Clinton supporters, while Bernie Sanders comes off as a wronged saint (also warranted, especially in hindsight). I can relate to the defeatist attitude you mention, though the young people inspired to run for office lifted my spirits and I enjoyed following their motivated steps toward progress enough to give the film a solid B. How about you? Bruce: The young activists are indeed inspiring, but the people I most wanted to hear more from were the diverse array of first-time candidates, filled with determination and anger and hope. They're the kind of real people with complicated life stories I think Moore does best with, and the contrast to established politicians is stark. What I could have done entirely without is the long sequence of Hitler parallels. I'd like to think a discussion of the dangers of authoritarianism can be had without citing Nazism, which tends to shut down reasonable discourse. But I guess no one should go to a Michael Moore movie expecting him to be reasonable. He does get some credit for remaining his authentic, undisciplined self, nearly 30 years after Roger & Me. His fire is still burning hot, even if it's a bit scattered this time out. I give the movie a B-minus.